Will there be a spark that starts an economic fire? The global economy is slowing down with many countries in recession or on the verge of entering into a recession? Will Turkey be the first domino to tumble? Michael gives his thoughts. The Economy is Transitioning, are you ready? Do you have all your money in stocks and bonds? What happens if we see a sharp reduction in the markets. Have you prepared your life boat? Michael talks about alternate ways to make income without worrying about the markets. There are times to be Bold and times to be Cautious. We read the tea leaves daily; we do not want to make a Mistake! As a follower of the Business Cycle and a realization that life does not move in a linear fashion, but rather moves through Cycles. Each different cycle has a unique signature and a unique interaction upon other cycles. We leave the detail research to others, but collate and collect the research into a very usable form. The Presentation always incorporates the latest data. It is this edge that helps discern Us from everyone else allowing the deployment of Capital strategically, timely, and in the path of Growth. Our clients have experienced much better than average returns and have avoided costly mistakes due to our Forecasting. Isaiah 47:11 But evil shall come upon you, which you will not know how to charm away; disaster shall fall upon you, for which you will not be able to atone; and ruin shall come upon you suddenly, of which you know nothing. 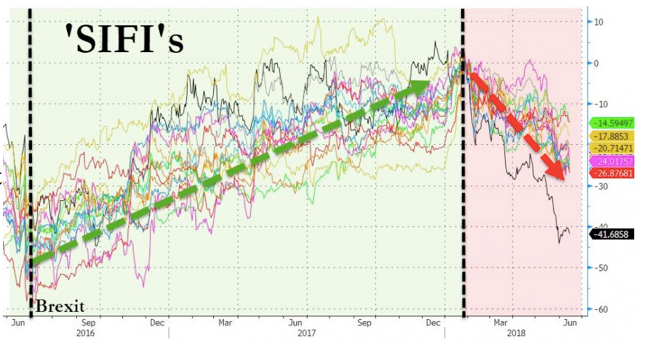 By Michael Douville – I have forecast the Global Slowdown and now that fact has been recognized by virtually everyone. The Globe is slowing so quickly that the World may be entering a period of vulnerability to a sudden downdraft. To paraphrase the famous question of “how does this happen?”: slowly, then all of a sudden! 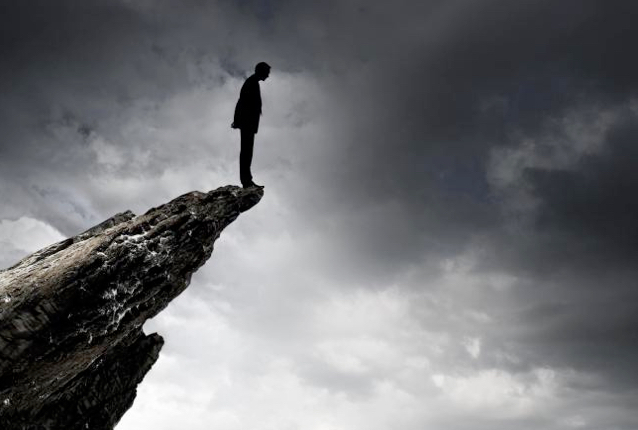 The economy has been dragged to the edge of a cliff; something just needs to push it over! The last decade of repressed interest rates has encouraged a Global Debt Binge! Italy is in Recession, The Netherlands is also. Germany is teetering avoiding a the statistical recession as the 3rdQuarter GDP was -0.2% but the 4thQuarter managed to rise to 0.0%. Revisions later may change the statistics. The 1stQuarter of 2019 is looking dismal as Global demand for Autos declined and mighty BMW announced it will not make earnings projections. The stock dropped over 6%. Lower earnings = lower stock prices! 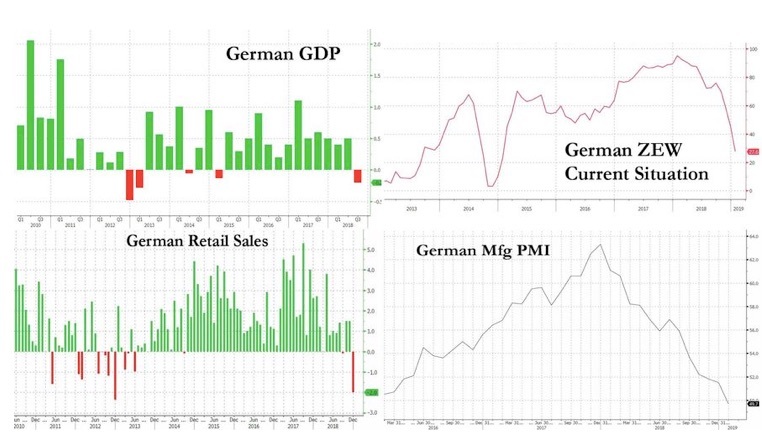 More bad news for Germany as several Economic Indices are severely declining and the European Industrial powerhouse may be heading into further trouble. As Germany’s trading partners suffer, so suffers Germany as the German Economy is certainly Export driven. European Interest Rates have been driven into negative returns forcing European Banks to search for better yields in Sovereign and Corporate Debt. 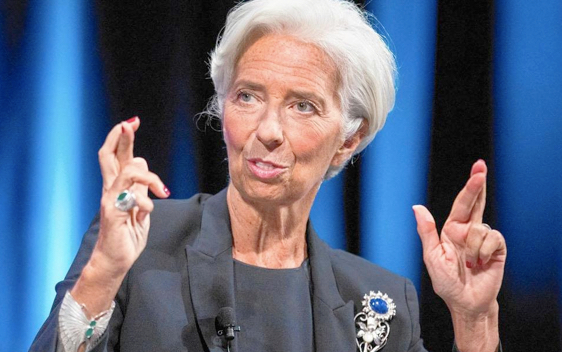 Many Spanish, Italian, and German Banks have still not recovered from the Great Financial Crisis and are “woefully unprepared” for the next financial crisis and the currency union is not resilient enough to emerge unscathed from unexpected economic storms” as reported by Christine Legarde. Which brings us to Turkey! 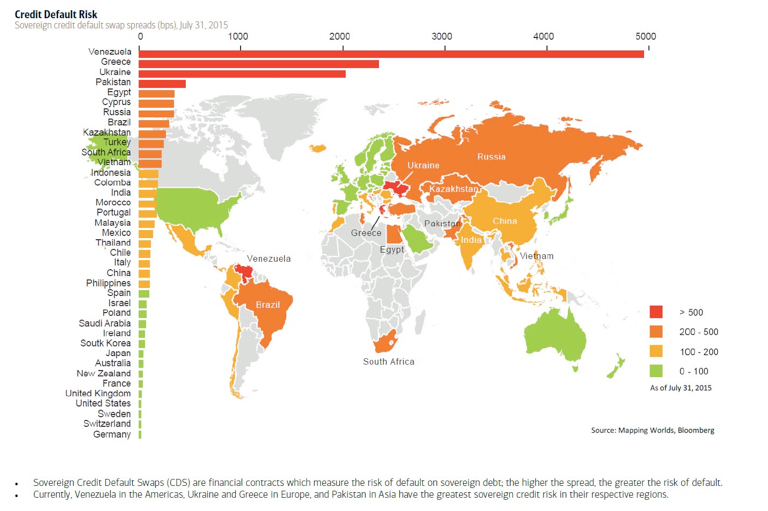 The last decade of repressed interest rates has encouraged a Global Debt Binge! Not only has business and private borrowers indulged beyond their capacity, but Nations across the World have found that it was very easy and expedient to borrow their way to Prosperity! Turkey is in trouble! The Turkish Economy has officially entered a Recession. Inflation has been unleashed on the population driving prices of everyday goods beyond reach. The Turkish national currency the Lira has lost tremendous value as the Foreign Exchange rate, although improved from the near 7 Lira to the US Dollar, is still vastly devalued at 5.75 Lira to the US Dollar. To make matters worse, the US Dollar is cycling higher. Portending Turmoil! Debt denominated in US Dollars is now coming due; Billions and Billions of US Dollars are coming due all while the Lira sinks and the Nation of Turkey is gripped by a Recession. Much of this debt is owed to the Banks of Spain, Italy, and Germany; Banks that are “ill prepared” for Loss!! Banks that are “Systemically Important”! Could Corporations in Turkey, struggling with Debt Repayment default on their loans? For that matter, could Turkey default on it’s Sovereign Debt? A Turkish default could lead to losses in Systemically Important Banks; losses now, while Europe struggles, would be felt everywhere!!! As I have recommended before, build reserves, pay down debt, cut expenses, review vulnerabilities both personal and Business, and discuss with your advisers as to what is Prudent in your Investment Portfolio. If contagion ignites, financing will be restricted; check with your lenders and review loans for refinance and Lines of Credit. Preserve Capital for the huge Opportunities that will surely present themselves. Review rental agreements and maximize tenant quality rather than maximize revenue. Rental cash flows may be the “Life Boat” to sustain the quality of life jeopardized by a Global Recession. For more detail linking modern day Turkey to ancient Meshech, Tubal, Gomer, and Beth Togarmah, see the link below. Turkish Lira Still Falling: Trouble Ahead! The brothers of Magog (Meshech, Gomer, and Tubal) appear to point to modern day Turkey. For more evidence pointing to modern day Turkey, see the link below. Michael Douville is a syndicated writer for the Wall St. Greek. Capital is the Life Blood of Business. When Credit is readily available, expansion of existing facilities to increase production becomes possible. With new production, employment expands, a ripple effect and a virtuous spiral starts spreading throughout the Economy. Optimism and Hope prevails as the outlook for the future brightens! Hope and Optimism are being crushed in Turkey! 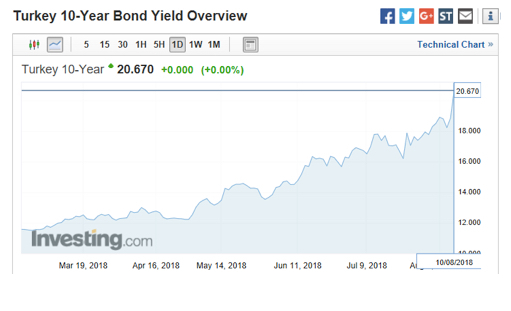 Monday August 27, 2018, Turkey’s 10 year Bond closed over 21%. These rates spell doom for the Turkey. Commercial debt in Turkey is estimated as $330 Billion US Dollars; Us Dollars have become a very precious commodity. The Turkish Lira has been declining for several years, but the US Dollar index DXY seems to have stopped declining and bottomed at 88.5 in February of this year and has been flirting with 97 just 6 months later; a technical target of 103.8 has been suggested by several analysts. 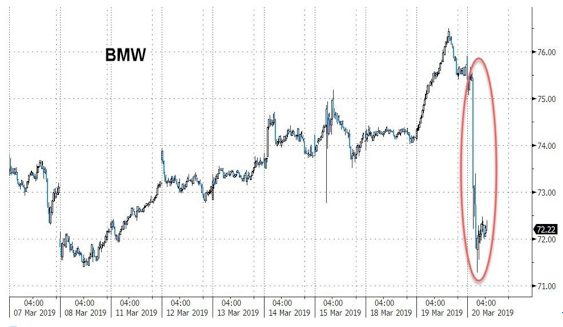 The strategy of borrowing in a declining currency and gambling that the decline will hold until time for repayment has backfired on all of the Emerging Market debtors; Turkey has also lost that bet! Not only has the Turkish Currency declined, economic conditions have deteriorated swiftly causing a lack of confidence which then results in a Credit Risk Premium for new debt. The unfortunate reality is Corporate and Sovereign Debt is never retired, just Refinanced; this negative loop has driven rates higher, unsustainably higher. 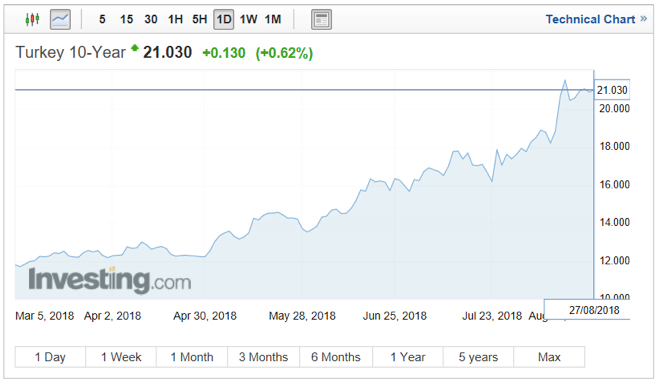 Monday August 27, 2018, Turkey’s 10 year Bond closed over 21%. These rates spell doom for the Turkey. Business will certainly suffer as Credit becomes illusive. Employment will suffer and Optimism will die. Compounding the loss of credit is the Currency Inflation that will transform any imported Goods or Services such as Oil, electrical and machinery spare parts, medicine, iron and steel plastics, fertilizer, and many industrial components into extremely expensive items; the Turkish Lira has lost 40% this year alone. This currency inflation will affect the populace as the Currency Inflation devastates their buying power. If shoes and jeans, bread and butter, antibiotics and insulin become HYPER EXPENSIVE, expect civil unrest! Turkey has the real possibility of defaulting on it’s debt! Planned, intentional? Probably not! It really does not matter. Turkey will look for new allies to extend crucial new credit such as Russia and China. New Business allies often become new military allies; overtures to other previously unthinkable Middle East nations such as Iran become thinkable. Turmoil may be on the Horizon. Learn the lessons from Turkey! Debt eventually overwhelms everyone and everything! Inflation, even currency inflation, raises the price of real things. Therefore, invest in REAL things, get out of personal debt, use investment debt judiciously and preferably use a fixed rate. Review your reserves and stockpile things that might become difficult to buy if Turmoil comes to our shores! Maintain and extend cash levels to weather an extended storm! 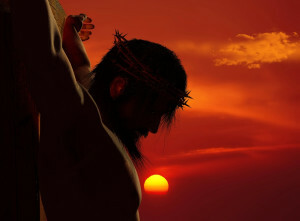 1 Timothy 6:10-11 For the love of money is a root of all kinds of evils. It is through this craving that some have wandered away from the faith and pierced themselves with many pangs. But as for you, O man of God, flee these things. Pursue righteousness, godliness, faith, love, steadfastness, gentleness. Timing is EVERYTHING!!! 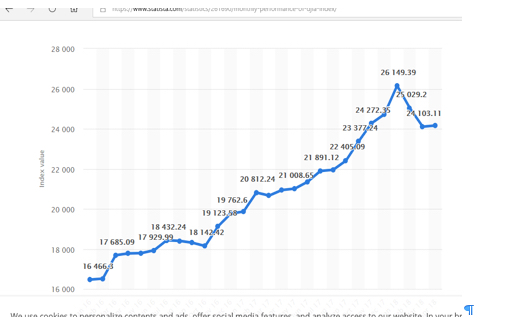 Investing in Stocks in early 2009 was the perfect time to enter the market. The S&P has enjoyed an unbroken string of positive years for the last 9 years; the second longest in History. An almost no risk Investment resulting in a 280% increase in the Index including dividend reinvestment; Wow! If one had the prescience to purchase Facebook, Google, Amazon, Apple, and Netflix in the same period, multiples of the S&P have been gained; 500-900%. WOW, WOW!! Using a little longer time line, historically, the Casino was not built on winners! Recently cracks in the Markets are starting to show. First Netflix missed the projected number of new subscribers and also lower revenue, and on July 17, 2018 the stock dropped 14% in after hours trading immediately after the announcement. This was followed one week later July 26th by Facebook’s lower than projected Quarterly and again after hours experienced the greatest loss in history of over $119 Billion Dollars in 24 hours. Just days later, another tech giant, Twitter, lost 21% in value on July 28th. Wealthy one day; not so wealthy the next. Timing is Everything! 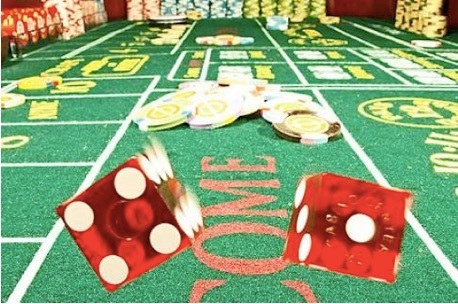 A player at the Casino has had an extraordinary run of luck; an extravagant bet of $100 has become $12,800 in 8 wins at the Dice Pass line. The player is allowing the winnings to accumulate in a double or nothing strategy. The” House” is encouraging another bet. After all historically, the player has won each time. What should the player do? Using a little longer time line, historically, the Casino was not built on winners! Timing is Everything! Assess your goals, assess your needs; you do to need to be 100% invested. You do not need to be invested 100% of the time. Maybe the advice should be take some of the winnings off the table!!! Maybe you have enough and it is time to reduce RISK! Deuteronomy 28:12 The LORD will open for you His good storehouse, the heavens, to give rain to your land in its season and to bless all the work of your hand; and you shall lend to many nations, but you shall not borrow. Deuteronomy 23:20 You may charge a foreigner interest, but you may not charge your brother interest, that the LORD your God may bless you in all that you undertake in the land that you are entering to take possession of it. Continuing with the theme of rising interest rates, bad things happen to Stocks as well. Rising interest rates compete with the dividend rate of stocks. Currently, the S&P pays a total of 1.68% for annual dividends, but accepting market risk. Currently in June of 2018, a 1 year Treasury held to maturity pays 2.34% with almost no risk. That rate has risen from 1.22% just exactly 1 year earlier. Further, Corporations have been the largest buyer of their own company stock. 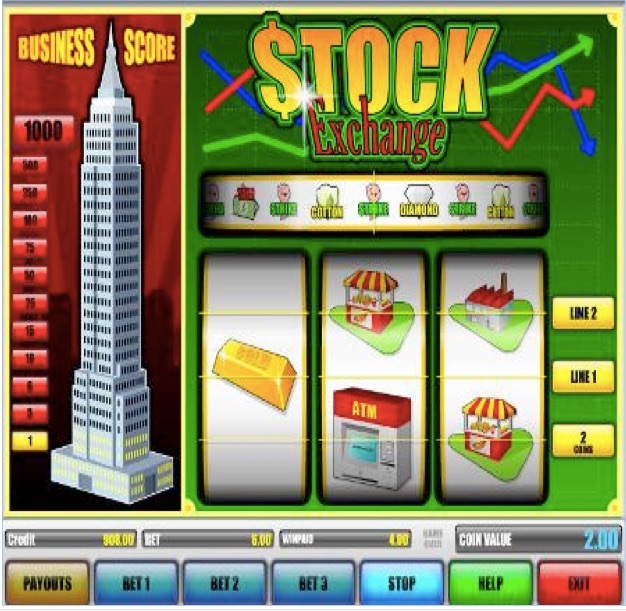 Executives have realized that by borrowing money to buy company stock, they can reduce the outstanding shares and thereby raise the per share return just by maintaining the same revenue. The Executives bonus is tied to increasing share revenue which increases their bonus share offering. Everyone wins; well the executives win! The Real Estate turmoil should be contained as a correction in an ongoing Bull Market. It could be severe! It could be scary! 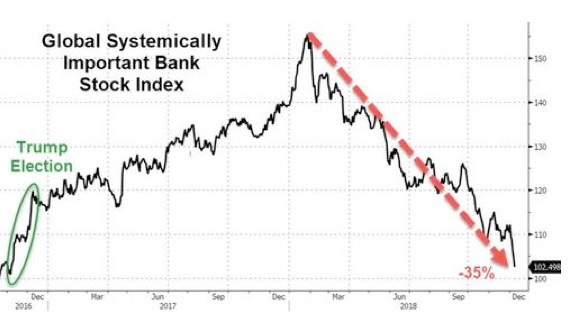 However, as rates rise, it is more difficult and more expensive to borrow funds earmarked for Financial Engineering so less and less buybacks will occur at exactly the same time Central banks are reducing purchases. Share prices are directly related to profits; rising rates will deteriorate those profits. As an aside, $4 Trillion in Corporate Bonds are due to be refinanced in the next 3 years; all will be at much higher rates. Higher rates cause costs of Production, Research and Development, and all CAPEX to rise squeezing viability. Just this one HUGE change should cause the hair on the back of your neck to rise; for 10 years, rates were basically ZERO. Now they are NOT! 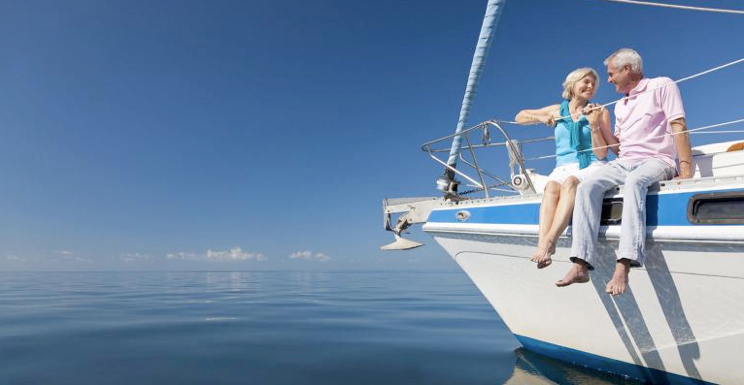 Retirees hold 70% of their assets in Stocks. Prices can go down much faster than they go up. In fact, they can plummet! This fact has been ignored for years until a 3000 point drop in 2 weeks in February 2018. UH-OH! Wake Up! Historic Margin debt may be one cause of these sharp air pocket declines. Leveraging an Equity position is oh so fun as the market expands to new levels. A reverse of trend will intensify and magnify the losses. Margin calls will force sales which forces prices down which forces sales. A very bad spiral. Boomers have watched this Movie before; get out of the way! Take Profits! Remove some portion of the portfolio to safety. Higher rates will impact the Real Estate asset class as well. Fewer families will be able to afford a home of their own as the Affordability Index is directly correlated to payment levels. Fewer buyers qualifying places pressure on prices. Property in overheated markets will be at risk. Luxury homes will become less affordable. Already our neighbors to the North are experiencing declining sales in Toronto and Alberta. New York City is starting to feel pressure in the luxury condo market as new units come onto the market already crowded with existing units. 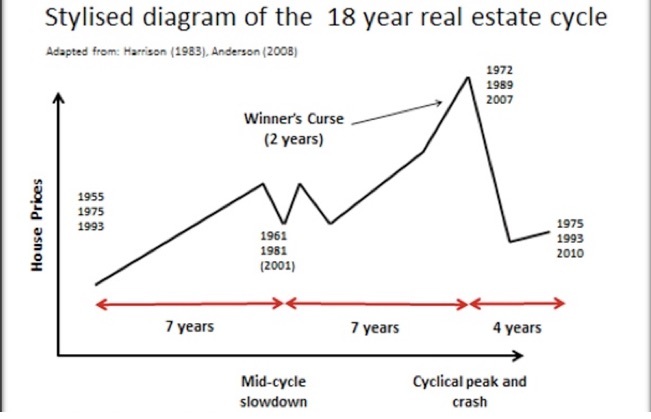 The Real Estate Cycle is long; 18.5 years. The last Real Estate Bubble scorched the Earth when it failed, but that was only 9 years ago. Too early for completion of that cycle. However, the timing would be perfect for a Real Estate correction which typically occurs 7.5 to 9.5 years from the bottom. Just as a reminder, the bottom was January 2010, give or take a few months. Simple math places the Real Estate Cycle in the middle of the Jeopardy Period; perfectly matching the expected Epic completion of both the Stock and Bond Markets. The Real Estate turmoil should be contained as a correction in an ongoing Bull Market. It could be severe! It could be scary! It will be a Generational buying opportunity for those with vision and courage; also surviving Capital!!! Remember the Affordability Index that should start to close families out of the buying market. They will become TENANTS!!! Long term TENANTS!! Fortunes will be made!!! Not only huge Capital Gains as the Real Estate Cycle moves out of the correction phase, but CASH FLOW! Increasing CASH FLOW. More revenue each year, growing earnings. If a little leverage is used, the tenants PAY OFF the Mortgage! Remember the Bengen Rule with 4% fixed for life depleting in 30 years? Throw it out!!! Not only will the rental revenue grow and grow providing more and more cash each month, but the loan is being paid off. A simple 20% down payment becomes a 100% after 30 years; multiplying by 5 times!!! Rentals are easy! Rentals are Profitable! Rentals are run by Property Managers, NOT you!!! Consult with your Professional about an Exit Strategy for the Stock and Bond Markets. Take Profits and preserve your Wealth! 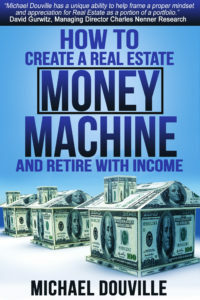 Move your assets into a different Asset Class that has a much longer horizon for Wealth and Income forever!!! The strategically important nation of Turkey is in Trouble; big Trouble! 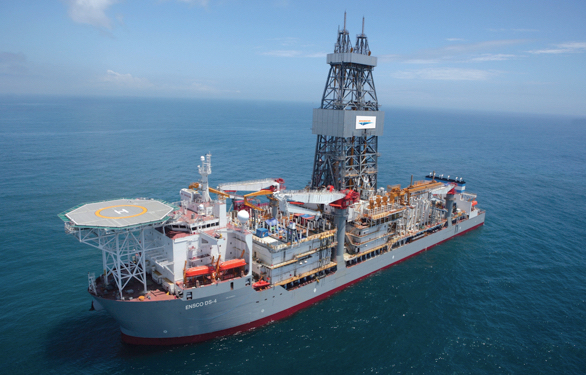 Turkey has threatened to invade Greece, has threatened Cyprus and oil explorers Exxon Mobil, Eni, and France’s Total for exploring in the Mediterranean; going so far as to threaten to sink oil rigs and Hydrocarbon Survey ships before the US 6thFleet intervened. Turkey has invaded Syria and attacked the Kurds in Iraq as recently as last June. The Government of Erdogan seems to be searching for an external enemy; a classic diversion from an Economic Decline that may be inevitable. You do not talk nice enough and do not give us enough respect; you are so mean to us! We may not pay the money we owe you and it’s YOUR fault! 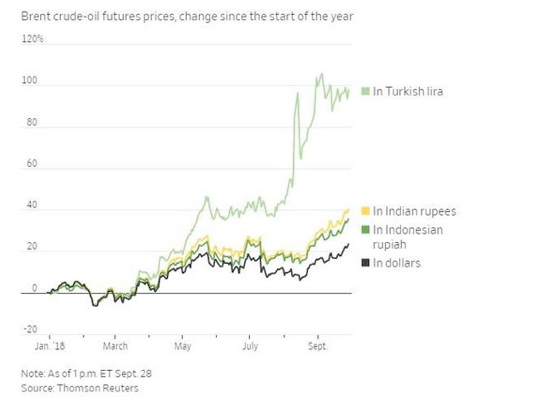 Turkey is in trouble economically as it’s currency, the Turkish Lira, plummets in value causing massive internal inflation as the prices of raw materials, energy, and of course food and gasoline skyrocket. A plummeting Lira means more than just higher and higher prices for the populace, it means more Lira are needed to pay back International Loans denominated in US Dollars. 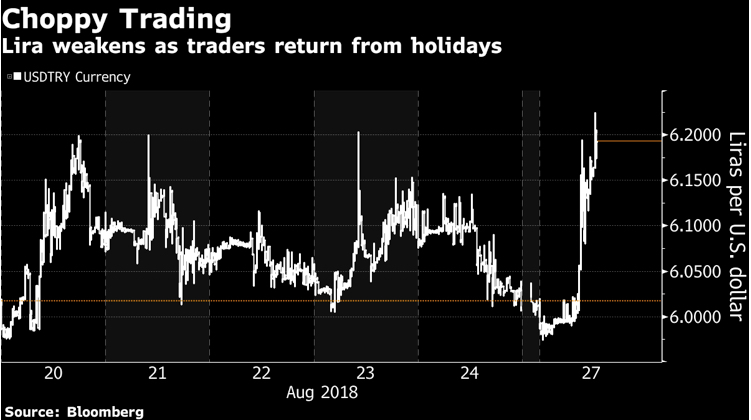 The Lira dropped almost 20% Friday August 10th; Turkey owes $240 Billion US Dollars. The decline of the Turkish Lira makes repayment more and more difficult. The US Dollar exchange reached a high of 6.43 Lira to the dollar; a loss of 40% so far this year. Loan repayment has jumped 40% in just 8 months!!!! The Turkish Sovereign 10 year bond has hit a record of 20.67% from 11.5% in January. Rising rates are a direct indicator of Market Risk. Mr. Market is stating Turkey will struggle to pay it’s Debt. These loans are never repaid, just rolled over; 20%+ is definitely a danger zone! Turkey has defaulted and not paid it’s debt 5 times in the last 100 years. A Turkish default will rock the Global Economy and hit the European Banks particularly hard. Italian Banks have been in the news recently and not in a good way; 20% are reported to be struggling with solvency. Deutsche Bank of Germany has recently closed offices and furloughed 10,000 employees; none can easily afford Sovereign Debt losses. These are Systemically Important Financial Institutions! A Turkish default or even the thought of a default should send shivers down your spine. An authoritative ruler who has replaced the head of the Central Bank with his son-in-law, who is threatening neighboring nations, who is threatening the US, who has a crumbling domestic economy that is heavily debt ridden may be looking for an excuse to blame others and not repay those that have wronged him. You do not talk nice enough and do not give us enough respect; you are so mean to us! We may not pay the money we owe you and it’s YOUR fault! Pay attention! Everything is connected. Turmoil will cause the US Dollar to get stronger; maybe a lot stronger! Turkey’s economy is struggling for the reasons stated above. Sanctions against Iran are taking their toll on their economy. The Iranian currency continues to get pummeled against the US dollar. American economic sanctions against Russia are taking a bite out of their economy. Ezekiel says Russia and its cohorts invade Israel for economic reason. Five times in Ezekiel 38:13, verbs of the verse indicate taking goods from Israel. ‘Have you come to capture spoil? Have you assembled your company to seize plunder, to carry away silver and gold, to take away cattle and goods, to capture great spoil?